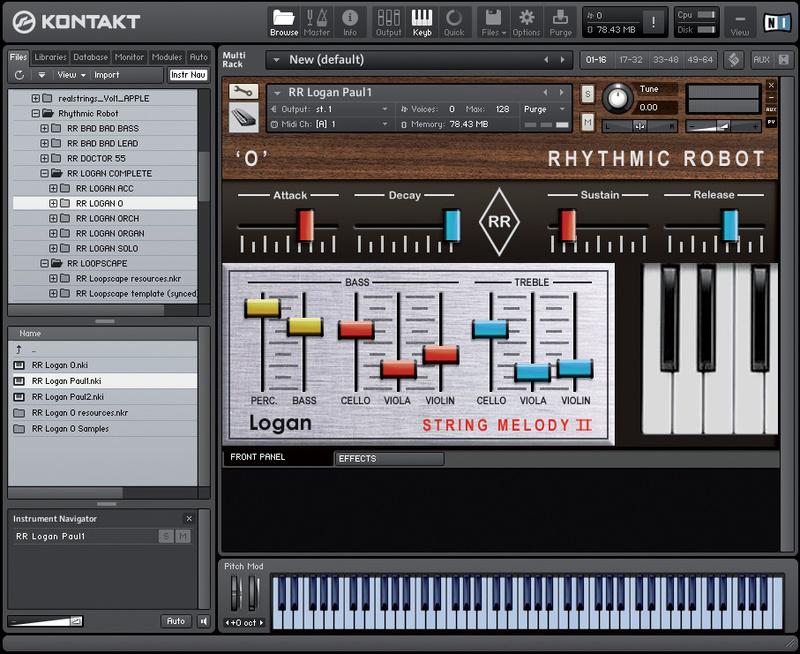 The Logan String Melody and the later Melody II are justifiably revered string machines. Of 1970s Italian manufacture, the String Melody was a split keyboard instrument with separate attack/release envelopes for each half of the split. There were dedicated mixer sliders for 'cellos', 'violins' and 'violas', plus two for the left hand's bass part. 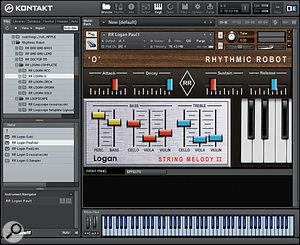 Unusually, these were at their maximum volume when fully down, not up.Pressing the five preset buttons (of the Melody II) introduced different variations of chorus and vibrato to the synth's basic tone, and it's these that form the basis of the latest set of Kontakt instruments from Rhythmic Robot. Collectively they're called 'Logan' and comprise Accordion, Solo, Orchestra, 'O' and Organ. Some string machines are easier to sample than others. The Korg Lambda, for example, has three detuned oscillators, meaning that you can capture its sound accurately by sampling every note. Instruments like the Logan present more of a challenge, as there's a rich blanket of chorus (created by a bucket-brigade delay and two LFOs) to consider. The occasional small glitch in some of the loops is most noticeable when sustaining individual notes, but even the relatively pure tones of the Solo instrument contain a subtle vibrato that can defy perfect looping. These few imperfections aside, Rhythmic Robot have successfully bottled the essence of each instrument. This means that you get the slightly weedy Accordion and Solo presets, the thick and lush Orchestra, the surprisingly playable Organ (church-like) and the enigmatically named 'O', which is actually fairly close to Orchestra. As you'd expect, sliders mimic the Logan's left- and right-hand mixes of violins, violas and cellos. Other than pitch separation, there's no tonal difference between these three instruments but when mixed together they create an ensemble that ranges from lush and warm to thin and ghostly. You can also choose how much of the two left-hand bass instruments are included, via the Perc and Bass sliders. The Logan's simple decaying bass was vaguely reminiscent of a string bass, while its sustained bass was reminiscent of nothing in particular. Unlike the original, this version is polyphonic. Also, the original machine had separate attack and release sliders for each half of the keyboard but here there's a global ADSR, so it doesn't quite offer the same possibilities. Each instrument has a set of effects, such as chorus, phaser and cab simulation, the last capable of beefing up the organ to pulpit-shaking levels, while the chorus and phaser transform the Solo instrument, especially, into a pleasing alternate string synth. Finally, there's a vibrato/tremolo section with variable speed and delay, which is useful. Overall, each instrument 'handles' close enough to the real thing for most recording and performance applications. Actually, the biggest audible difference is the lack of noise. I've never heard a Logan sound so clean, and it's an unusual experience to play one without reaching for a noise gate. As with other RR instruments, the samples are 24-bit mono and well recorded, and every parameter is MIDI controllable. Incidentally, you can eat up lots of polyphony due to the layering of samples, as even when a volume slider is at zero, resources are consumed. Download £4.95 each, or £19.95 for the set.